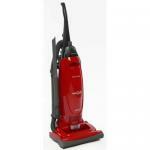 Bagged upright vacuum cleaners are specifically designed for use on wall-to-wall carpeting. These machines have a revolving brush that sweeps down into the carpet to uproot the dust and dirt that is trapped there. Upright vacuums generally do not perform well on bare floors because the air movement created by the revolving brush scatters the dirt around as you move the vacuum towards it. The disposable bags used by bagged vacuum cleaners are a cleaner and easier method to dispose of the dirt collected by your vacuum cleaner. Many manufacturers make bags that are 3+ ply with an inside cotton liner that filters dust far better than the old paper vacuum bags. A year�? ?s supply of disposable vacuum bags usually costs between twenty and thirty dollars depending on how often you vacuum, and how often you change the bag.